Last year, she entered two recipes in the Moxie Recipe Contest. One was for Moxie BBQ Chicken Sandwiches and the other was for Moxie Cake Pops. Little pieces of frosted cake on a stick. I can’t even fathom how to put cake on a stick, but Dawn did. Mix cake mix with Moxie soda, mix until there are no lumps in the batter, and bake in a 9 x 13 inch cake pan lined with parchment paper for approximately 35 minutes or until knife inserted comes out clean. Cool completely. When the cake is cool, crumble it into a large bowl. Add frosting and mix with your hands until it can hold a ball shape. Roll the cake and frosting into a tight ball and place on a plate. Repeat until all the cake mixture has been used. Melt 2 – 4 ounces of candy melts in the microwave. Dip the tip of the cake pop sticks into the chocolate and insert into the cake balls, approximately halfway through. Melt the remaining chocolate in a large cup in the microwave. Remove cake balls from the freezer and dip carefully into the chocolate until covered. Let the excess chocolate drip off; swirl and tap gently if needed. Add the jimmies before the chocolate sets. Once the chocolate sets, store in an airtight container. Wow…I made a necklace out of watermelon seeds once, but this creation is nothing I would have ever attempted. You’ve just got to love these people with Moxie! What will Dawn Hartill do this year? Stay tuned. 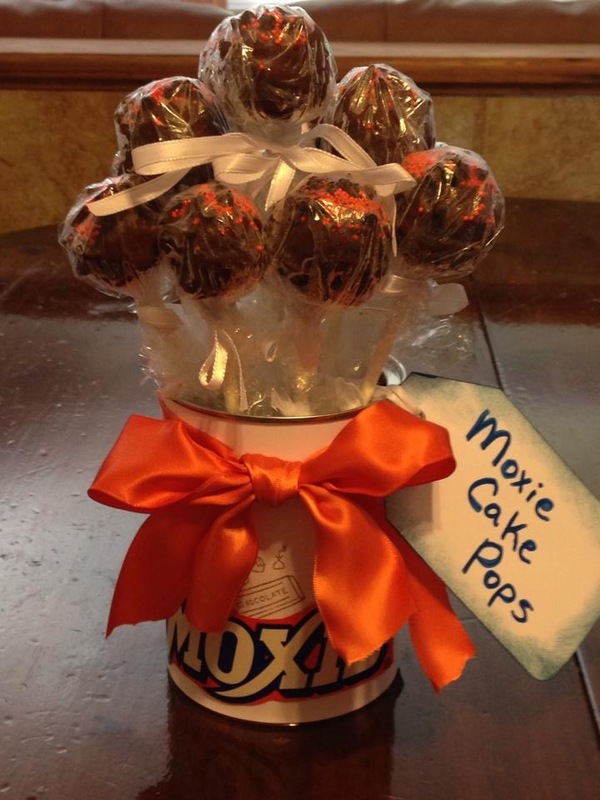 This entry was posted in Moxie Recipe Contest and tagged Cake on a stick, Dawn Hartill, Moxie Cake Pops, Moxie Recipe Contest, People with Moxie. Bookmark the permalink.